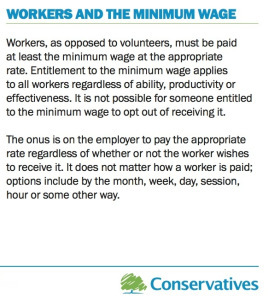 The breath-taking hypocrisy of both the Tory Party and the TUC was laid bare this week after an astonishing document emerged which advises Tory Party MPs on how to dodge minimum wage legislation by renaming interns as ‘volunteers’. The leaflet, which was published on the Graduate Fog website, provides legal advice on minimum wage legislation along with a template letter that can be used to fob off any enquiries to MPs about their use of unpaid interns. This shoddy attempt to dodge the rules on paying workers comes in the same week that David Cameron announced in Parliament that his Government was naming and shaming firms which don’t pay minimum wage.